Some of the largest factories just stopped paying wages, and thousands of workers are owed six months’ back pay or more, Pavel Lisyansky of the EHRG said in an interview. “In these circumstances, people of course start looking for another job. Then the management doesn’t pay them the back pay that they are owed. Why settle up with them, if they are leaving? Lisyansky reckons this could be the beginning of the end for Ukraine’s old post-Soviet trade unions – not only the old “official” unions, that originated in quasi-state Soviet structures, but also the post-Soviet “independent” unions set up to compete with them. Membership is falling: a worker who has been ignored at his time of need in his old workplace is unlikely to sign up in his new one. In response, the EHRG is working to establish territorially-based organisations, provisionally called “working people’s unions”, that will bring together all workers – at any workplace or none – in a particular locality. This will be “a sort of alternative to trade unions […] to address the need for additional instruments for defending people’s rights in Ukrainian society. Workers are owed months’ worth of back pay at some of the largest workplaces in the region, including the Severodonetsk Azot chemical plant, where 5000 employees are owed six months’ wages; Lisichanskugol’ coal company, with 5000 employees at four pits; Toretskugol’ coal company, with 2500 employees at four pits; and the Donetsk railway network. overall economic output, and a larger proportion of iron, steel, metallurgical products and chemicals production. Now Russian-backed “People’s Republics” have been formed in both regions, and the front line cuts straight through what used to be a highly integrated industrial complex. Supply chains have broken down, even between factories owned by the same companies. A blockade, initiated earlier this year by Ukrainian nationalist politicians and then taken up by the Kyiv government, has made things worse, leaving power stations short of coal. The immediate impulse for the EHRG’s formation – on 27 July 2014 by a group of lawyers, themselves internally displaced persons, at Debal’tsevo – was “the large number of breaches of human rights in the area of military operations”, Lisyansky said. He had himself spent the previous ten years in independent trade union organisations. The EHRG set up four offices to provide civil liberties advice and support, but those at Debal’tsevo and Uglegorsk were destroyed after the Russian-backed separatists took control of those areas. Since January 2015, the group has been based at Lisichansk, in the part of Lugansk controlled by the Ukrainian government. There are smaller offices at Toretsk and Svetlodarsk. 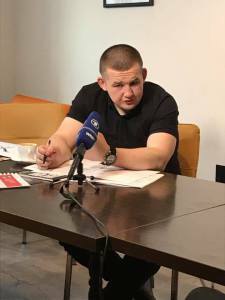 On top of the campaigns over back pay, Lisyansky believes the EHRG can count as one of its successes the release from prison in the Lugansk People’s Republic of Aleksandr Yefreshin, who had fallen into a legal no-man’s land. Yefreshin was sentenced in 2013 to eight-and-a-half years for his part in the theft and burning of a minibus – a drunken prank. He began to work in prison, under a scheme that allows sentences to be cut by two-thirds for those who do so. But with the outbreak of war he found himself in a separatist prison where Ukrainian law did not apply, and detainees were effectively used as slave labour. The military activity is quieter, but hasn’t ended by any means. People live in a state of permanent stress. Shots and explosions can be heard at all times, the whole regions is militarised. There are soldiers, weapons, checkpoints everywhere. So people are desperate, they hardly even think about day-to-day problems, they just want the war to end. [The factories are open, but people don’t get paid, the back pay debts keep growing, but] people don’t go out and protest, because the law enforcement agencies immediately accuse them of trying to destabilise the situation in the region. I asked Lisyansky about the opposition by community activists to the railroad blockade inspired by right-wing nationalists earlier this year. There was very little support for the communities, he replied. It was only us, and a group of trade unions and community organisations in the localities who spoke out against the armed right-wing radicals. We said no [to the blockade] emphatically, and called for people to sit and negotiate [to allow trade links to continue]. A storm of criticism and threats was unleashed against us. I was accused a puppet of bandits who were against the ‘Ukrainian patriots’ [who started the blockade]; some of my co-thinkers were simply threatened. But the state supported the blockade nonetheless, and that put industry in eastern Ukraine on its knees. In the territory not under Ukrainian government control, many of the factories laid off workers and stopped paying wages. The separatists implemented ‘nationalisation’ of factories belonging to the Ukrainian state, and those are now in a mess. The EHRG has participated in a widespread protest against pension reforms being undertaken by the Ukrainian government at the behest of the IMF. The reform will strengthen the link between the level of contributions and what people receive, and effectively raise the statutory retirement age, by increasing the term over which a person must contribute from 15 to 25 years. Lisyansky said: “Yes, I spoke out and will keep speaking out against this reform, which I think breaches people’s rights.” Both “official” and independent unions had protested, but this had had “little effect” on the political process, he said. Yes, they live in very bad circumstances. There is no law, no rights, people are defenceless. A person can be arrested for some contrived reason, for having a different political position, for insisting on his rights, because he competes somehow with someone [in power]. In the prisons [in the separatist-controlled areas] there is real slavery. Completely arbitrary rule. … It makes me sick that this is happening in the place that I come from. I can not return there. I am on hit lists, and if I went to the so-called “Lugansk People’s Republic” [LPR] I might just be shot. I very much want to visit the grave of my father, who was a workers’ leader – but I haven’t done, for three years. I worry a great deal about this. There are no trade unions [in the separatist controlled areas]. There are just some structures designed to win international influence, to legalise those republics. 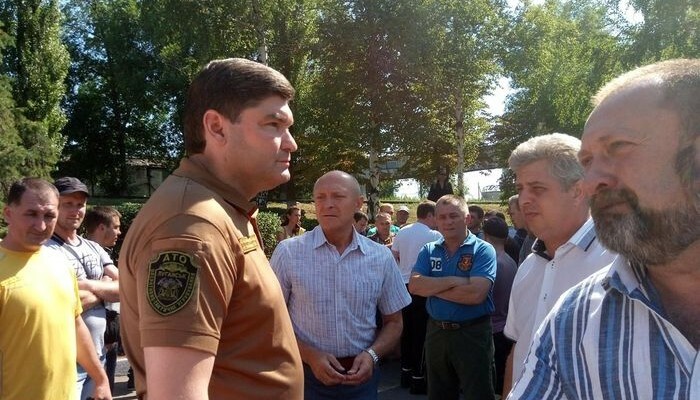 Did you hear of any trade union protests in the LPR? I know of very small-scale protests that were put down by the “Donetsk People’s Republic” [DPR]’s armed forces. […] The level of pay is going down, up to 60% of the workforce has been laid off in the factories. They are either closing all together, or temporarily. New trade unions have been formed at these enterprises to control workers. It’s painful to answer these questions. We are carrying out several projects on human rights that are supported by the German consulate in Donetsk region and the Rosa Luxemburg foundation in Berlin. Support from these international donors is very important for us. In the first case, with the consulate, we run an integrated human rights project that includes monitoring breaches of human rights, offering legal advice, and the running of events highlighting human rights and organising to defend rights. In the second case [with the Rosa Luxemburg foundation] the project is directed at legal edcuation for workers, trade union activists and leaders, and legal officers in trade unions in eastern Ukraine. […] We hope that by raising the level of legal understanding among ordinary people in this way, that we can resist the attacks on labour rights and social-economic rights. The EHRG’s strategy is to develop legal advice and representation, to develop human rights defence organisations; to continue to monitor breaches of human rights in the areas where military conflict continues; to support the rights of internally displaced persons; and to develop conflict resolution in communities. It’s clear that the EHRG, and other activists struggling with the consequences of the military conflict, need solidarity and support – over the long term – from other workers’ organisations in Europe. Lisyansky has made some links with German trade unionists and asked me, through this interview, to offer his hand of greeting to workers’ organisations elsewhere. Ukraine is not so far away. If international solidarity means anything, it means building relationships with organisations such as this. GL, 4 August 2017.